Read my review of Der König Kandaules at Bachtrack. 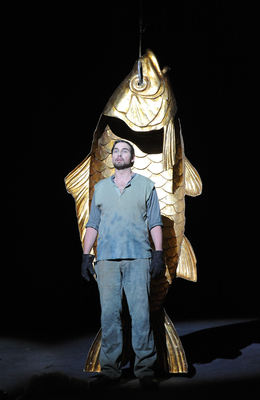 Note how most people writing about this opera conspicuously avoid trying to say what it’s about. I don’t like evasion and just admitted that I have no real idea. Maybe I like certainty too much, but the libretto of this opera had a higher ratio of the cryptic to the significant than I can find that satisfying. There are glimmerings of significance–and Neuenfels’s production does a good job in replicating and extending the text’s ambiguity–but the whole thing just slips from your grasp in a way that I ultimately found a little unfulfilling. It’s not that I need things to be spelled out, but it’s blatantly allegorical without a referant in sight. But the score is beautiful and the performance is quite good, and maybe you’ll be less desperate for a moral than I am. And who knows when you’ll get the chance to see it again. So go! Regie fans may be interested to know that the design, in which an allegorical figure of Zemlinsky appears and Gyges and Kandaules appear as doubles, is by Christian Schmidt, who has previously used both of these devices in his design work with Claus Guth. Remaining performances are May 8, 12, 17, 23, and 26. A baffling opera, I agree. Hard to say how rewarding struggling with its elusiveness would be. And it's such an inviting vessel for postmodernist constructs, as Neuenfels demonstrated, though the racial and class filters seem too obviously imposed for me. I think there's some validity to the gendered reading, as Nyssia’s objectification and subjection is emphasized, but I find it problematic. Like that Nyssia’s tipping point seems to be as much that Kandaules *hasn't* subjected her sexually as it is that he's pimped her out. My own far-fetched PoMo two cents, extending both this and the voyeurism you observed, is that Kandaules is impotent, the psychological effects of this condition governing his behaviour and actions – which conceal and compensate for his sexual incapacity – throughout the opera. Well before Nyssia plots his death and proclaims Gyges king, Kandaules doesn't just befriend Gyges but adopts him (in all but name), seemingly as a surrogate successor (I like that Neuenfels dressed Gyges as Kandaules in Act II). A courtier brags of having cuckolded Gyges but Kandaules makes no public assertions of virility. He is never really established as a figure of authority in his court and is readily manipulated by his courtiers, elements that are publicly assigned to his benevolence but also suggestive of a weakness stemming from sexual inferiority. Symbolically, there's the fish (a swollen carp, no less) and the water from whence it came; both were known to Herodotus as symbols of sexual health and fecundity through their association with Atargatis, a sea goddess who represented fertility and mother of Ichthys, from whom we get the Christian fish symbol. That the fish and ring comes from concatenating Gyges and Polycrates (Gides idea?? Der Ring des Polykrates is of course a Korngold opera) adds to this reading. But it’s too circumstantial to satisfy as an explanation. I think a problem is that if you apply just one postmodernist filter it seems forced and yet if you try to juggle a number of them it appears confused. Then again the work is unfamiliar to me and it does have a system of Leitmotiven that could be revealing if studied more closely. The solemn one that appeared connected to Gyges cropped up in some interesting places, for instance.